This surname is of Anglo-Saxon origin, and is a locational name from any of the places so called, for example those in Cumbria, Lancashire, Northumberland, Westmorland, and in the West Riding of Yorkshire. Recorded variously as "Bodeltun", and "Bodeltone" in the Domesday Book of 1086 for the above counties, the name, in all cases, derives from the Olde English pre 7th Century "bothl", "botl", dwelling house, hall, with the Olde English "tun", enclosure, settlement. Locational names were originally given to the Lord of the Manor, or as a means of identification to those who left their place of origin to seek work or settle elsewhere. 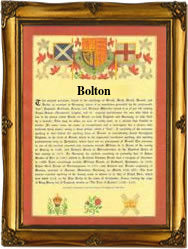 Early examples of the surname include: Thomas de Bolton (Warwickshire, 1262) and Robert Bolton (Lancashire, 1371). One of the earliest recorded bearers of the name to enter America was Thomas Bolton who embarked from London on the ship "Bonaventure" bound for Virginia in January 1634. No less than twenty-five Coats of Arms have been granted to this illustrious family. Those borne by Bolton, Lord Mayor of London, 1667, depict a silver hawk on a black shield. A hawk belled silver is on the Crest. The first recorded spelling of the family name is shown to be that of Robert de Boulton, which was dated 1191, in the "Early Yorkshire Charters", during the reign of King Richard 1st, known as "Richard the Lionheart", 1189 - 1199. Surnames became necessary when governments introduced personal taxation. In England this was known as Poll Tax. Throughout the centuries, surnames in every country have continued to "develop" often leading to astonishing variants of the original spelling.